Note: for a short period of time this product was called MultiGrid-II. A maximum generator or grid current can be set. The Multi will then take account of other AC loads and use whatever is extra for battery charging, thus preventing the generator or grid from being overloaded (PowerControl function). PowerAssist takes the principle of PowerControl to a further dimension. Where peak power is so often required only for a limited period, the Multi will compensate insufficient generator, shore or grid power with power from the battery. When the load reduces, the spare power is used to recharge the battery. 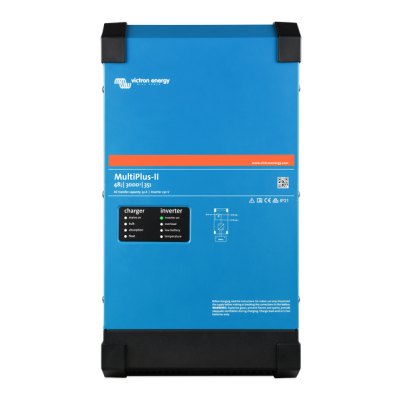 The MultiPlus can be used in off grid as well as grid connected PV and other alternative energy systems. Several system configurations are possible, for more detailed information see the ESS Design and configuration manual. Install a Venus GX or a Color Control Panel to connect to the internet. Data can be stored and displayed on our VRM (Victron Remote Management) website, free of charge. When connected to the Ethernet, systems can be accessed remotely and settings can be changed.